Saute onions, mushrooms and garlic in olive oil until vegetables are tender. Add tomato sauce, sugar, Italian seasoning, salt and pepper. Bring to a boil and reduce heat and simmer for 1 hour. Cook cheese ravioli according to package instructions. Drain and keep warm in pan with covered lid. Add ravioli and simmer an additional 10 minutes. Top with mozzarella cheese, Parmesan and parsley flakes. Slice baquette bread and saute in pan with olive oil. Turn when golden brown. Top with Parmesan cheese, garlic sprinkle and parsley if desired. I hosted a Pampered Chef Party and the demonstrator made this delicious "Zesty Ravioli Skillet". It was so good that I made it the next day. We grilled some chicken and made some buttered toast to go with it. Wash spinach, drain and set aside. Add oil to skillet; heat over medium-high heat 1-3 minutes or until shimmering. Finely chop jalapeño and add to skillet; cook and stir 1 minute or until crisp-tender. Add garlic and cook and stir 15-20 seconds or until fragrant. Add tomatoes, salt and black pepper to skillet; cook and stir 1-2 minutes or until simmering. Add ravioli; stir to coat. Cook, uncovered, 4-5 minutes or until tender. Stir cream into skillet. Cook, uncovered, 1-2 minutes or until simmering. 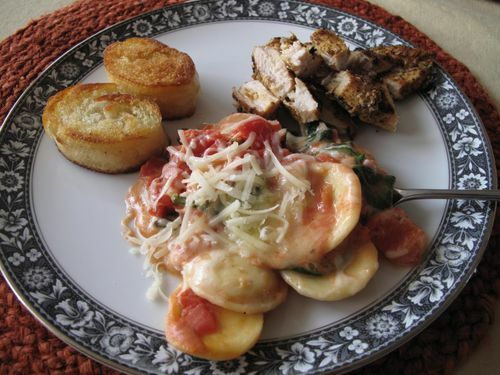 Sprinkle spinach over ravioli; cook, covered, 1 minute or until spinach starts to wilt. Remove skillet from heat. Top with cheese; cover skillet and let stand 1-2 minutes or until cheese is melted.